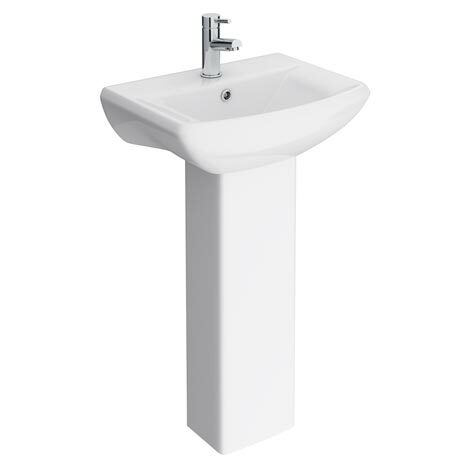 The stylish contemporary Asselby cloakroom basin with pedestal designed and manufactured by leading bathroom brand Premier, perfect for creating a neat, contemporary look and feel to your new bathroom. The Asselby basin is supplied with a full pedestal which will conceal unsightly pipework from view. Designed to be used with a Mono basin mixer (not Included). Absolutely love my new sink mangaged to get it in the sale it looks so sylish and classy. Can't believe how good this product looks - I bought another one for my en-suite straight after receipt. Very well packed and delivery quick. Combined with the waterfall mixer, room looks fantastic. Highly recommend.